Veterans who have served in the post-9/11 era have a more positive view than the general public about the overall worth of the Afghanistan and Iraq wars and the tactics the military has used to wage them. Even so, in a Pew Research Center survey conducted in 2011, only one-third (34%) of these recent veterans said that both wars have been worth fighting; nearly as many (33%) said neither conflict had been worth the costs. Looking at each conflict individually, 50% of post-9/11 veterans said the decade-old war in Afghanistan has been worth fighting, while 44% viewed the 8½-year-old conflict in Iraq the same way. 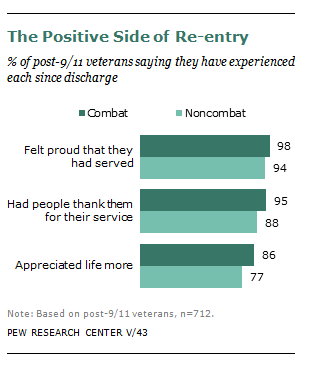 However, despite those mixed views and the hardships veterans have endured in the service and in their re-entry into civilian life, they have positive views of their experience. Post-9/11 veterans are proud of their service (96%), appreciate life more (82%) and believe that their military service has helped them get ahead in life (74%). Large majorities say that serving in the military has been either very or fairly useful in helping them become more mature (93%); gain self-confidence (90%); learn to work with other people (90%); and prepare for a job or career (72%). Some 92% say that since they got out of the service, someone has thanked them for serving.